The extraordinary community of Dove Valley Ranch is found in the exciting City of Peoria, Arizona. Peoria has been recognized as one of the best cities in which to live and is home to over 171,000 residents who agree. With 300 days of gorgeous sunshine, you will have seemingly endless opportunities to enjoy the area’s beautiful parks, scenic trails, breathtaking views and numerous other amenities and attractions. For example, Peoria has fabulous entertainment options at venues like the Arizona Broadway Theatre. This extraordinary theater offers highly acclaimed Broadway performances and fine dining as well. In Old Town, you’ll find another delight, The Peoria Center for the Performing Arts. This Center serves as the stage home for a nationally recognized community theater called Theater Works. If professional or college sports are more your style, you are in luck! The Peoria Sports Complex serves as the spring training facility for the Seattle Mariners and the San Diego Padres. Furthermore, Peoria is only minutes from opportunities to enjoy NFL, MLB, NBA, NASCAR, NHL and major college games. In addition to great entertainment, Peoria also affords amazing recreation opportunities. Within this extraordinary city, you will find two regional parks and thirty-three delightful neighborhood parks. The 84-acre Pioneer Community Park is found in the southern part of Peoria and provided a dog park, a 5-acre fishing lake, and multiple athletic fields. The Rio Vista Recreation Center and Park is a beautiful destination in the heart of the city and provides an impressive skate park, softball fields and batting cages, volleyball courts, a state-of-the-art recreation facility, ramadas and an urban fishing lake. Not to mention the over twenty-five miles of trails to hike, bike and jog in Peoria, or the amazing Lake Pleasant Regional Park, which is a local hotspot for camping, wildlife viewing, and all sorts of water activities. 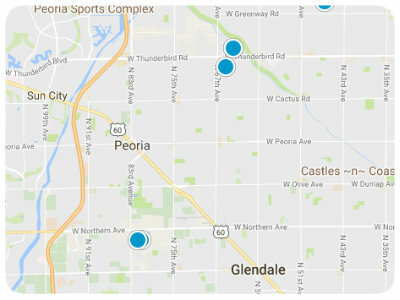 With all of these spectacular amenities, plus highly-rated schools and gorgeous views, Peoria is a must-consider destination for prospective homebuyers. And within this marvelous city, there are equally impressive neighborhoods from which to choose. Among the most noteworthy is Dove Valley Ranch. Dove Valley Ranch is a neighborhood of single-family homes that were constructed between 1999 and 2002. Homes for sale in Dove Valley Ranch come in a broad price range that is determined by the property’s age, size, location, style and special features. Dove Valley Ranch real estate includes homes with two to seven bedrooms and two to four bathrooms, typically ranging from as little as 923 square feet to over 4,000 square feet of living space. Students residing in Dove Valley Ranch attend Coyote Hills Elementary and Sunrise Mountain High schools. You’ll find this prestigious community west of Silverton & Sunrise Desert Mountain, south of The Meadows and Starlight Estates, east of Camino A Lago, and north of Dove Valley Ranch II and Silverton II. The northern boundary is West Deer Valley Road, the western boundary is North 95th Avenue, the southern boundary is West Lake Pleasant Parkway, and the eastern boundary is North 87th Avenue. If you would like to learn more about the homes for sale in Dove Valley Ranch of Peoria, Arizona, please allow us to assist you and contact us today.